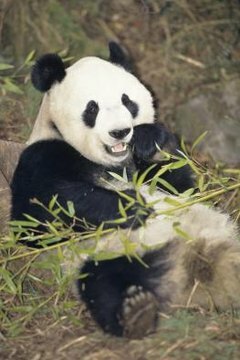 The giant panda, endemic to central-western and southwestern China, is most notable for the black patches of fur around its eyes, which contrast with its white face. It has black fur across its back and has black ears, arms and legs. As few as 1,000 are left in the world, rendering them an endangered species. A variety of factors, both natural and human-made, have contributed to the giant panda's endangered status. For many years, it was believed that giant pandas were solitary creatures. They were never observed traveling or coexisting in groups. When a giant panda is attacked, it has to fend for himself rather than rely on a group to help and protect him. Injured giant pandas are often left to fend for themselves as well. Their solitary nature was seen as making them vulnerable to predators. However, recent studies cited by the Smithsonian National Zoological Park show that small groups of giant pandas share large territories. Some, according to these studies, will even meet outside the very short breeding season. Female giant pandas ovulate only once a year, during spring, and are fertile for only three days per year. The short breeding season results in a low reproductive rate, which has not helped its endangered status any. Giant pandas reach sexual maturity between the ages of 4 and 8. Females give birth to one or two cubs no more than 160 days after mating. If she gives birth to two cubs, however, she tends to only care for one of them and leaves the other to die. If a mother gives birth to two cubs in captivity, handlers help raise the abandoned cub. Despite being omnivorous and consuming birds and rodents from time to time, a giant panda's diet consists primarily of bamboo, which not only grows in very specific areas, limiting a giant panda's habitat options, but also is a low-energy food. Giant pandas must consume from 20 to 40 pounds of bamboo every day, which means they tend to clear out the supply in a short period of time, which forces the giant pandas to either relocate or starve to death. Even if they don't diminish their bamboo supply, giant pandas still have to choose between relocating and starving because bamboo plants bloom and die at the same time. Giant pandas do not make permanent dens. Instead they take temporary shelter in trees or rocky areas. Because they don't have permanent homes, giant pandas are vulnerable to the elements. Giant pandas do not hibernate, preferring rather to move to lower elevations during colder weather. Short breeding seasons, low birth rates and limited bamboo supplies all contribute to making the giant panda an endangered species; however, human encroaching has also adversely affected the black and white mammal. The giant panda's habitat has gotten significantly smaller thanks to human development depleting its bamboo-rich forests. Poachers continue to deplete the giant panda's already diminishing numbers, despite strict regulations in China. Penalties include fines and jail time for those who hunt giant pandas for trophies and their black and white fur. Giant pandas are also caught in the crossfire of humans hunting for other animals and ensnared in traps left for other animals.